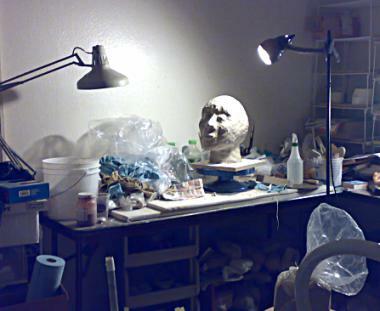 A Tour of My Studio! 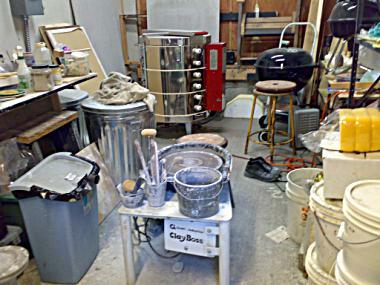 In the back behind the house, I have set up my pottery studio in an old storage shed (figure 2). There is a brand new electric kiln (an automatic Skutt! ), a used electric wheel that I picked up for a good price, and a little portable kick wheel. By the way the large BBQ grill in the back is also a pottery tool — I will be using it for doing some pit firing experiments. 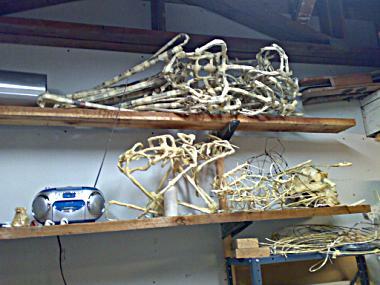 This entry was posted on Thursday, July 12th, 2007 at 12:46 am and is filed under About Me, General Pottery, Sculpture. You can follow any responses to this entry through the RSS 2.0 feed. You can leave a response, or trackback from your own site. I love your studio! Messy is homely! I am currently setting up my own in the “former dining room” too.